Dwight guitars were made by Epiphone as the house brand for Sonny Shields Music in East St Louis IL, which was owned by Mr Charles â€œDwightâ€ Shields. Sonny Shields Music was a pretty big music shop back in the 50’s and 60’s and they also had several Dwight guitars made by Supro (and built by Valco), although the most well known was the rebranded Epiphone Coronet, marketed between 1963 and 1968. The Epiphone built Dwight Coronet model has â€œDwightâ€ on the headstock and a â€œDâ€ in the scratchplate, similar to the â€œEâ€ in the Epiphone models. Epiphone guitars of this period were built by Gibson at the Kalamazoo, Michigan, and were distributed by the Chicago Musical Instrument Company (CMI). An ex-employee of Sonny Shields says that CMI sold the rebranded Dwights to Sonny Shields by the dozen, and that there are probably lots of old Dwights sitting in basements and attics throughout Southwestern Illinois! These guitars, while rare and unusual are still around and tend to be cheaper that the Epiphone equivalent. Many Coronets have the 6 on one side headstock as opposed to the 3 per side style of the Dwight, which is stronger in construction, and to my mind, looks better. 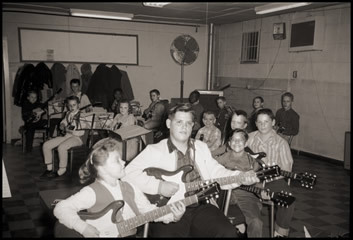 Epiphone guitars of this period were generally well made (American Epiphone production ran from 1961 -69) and the Dwights counted among some of the better ones. These cool looking guitars are well worth picking up if you come across one. I have one of the Epiphone Dwight model guitars. Batwing with tremolo. anybody know where I can find parts for a dwight? I grew up on 13th and State Street in East St. Louis. If the building still stands I am sure my nose print is still on the front glass looking in. For the guitarists who may be interested, I own the “Dwight” Trademark and build Dwight guitars in England. I can be contacted at dwightguitars@hotmail.com. Pics are available.